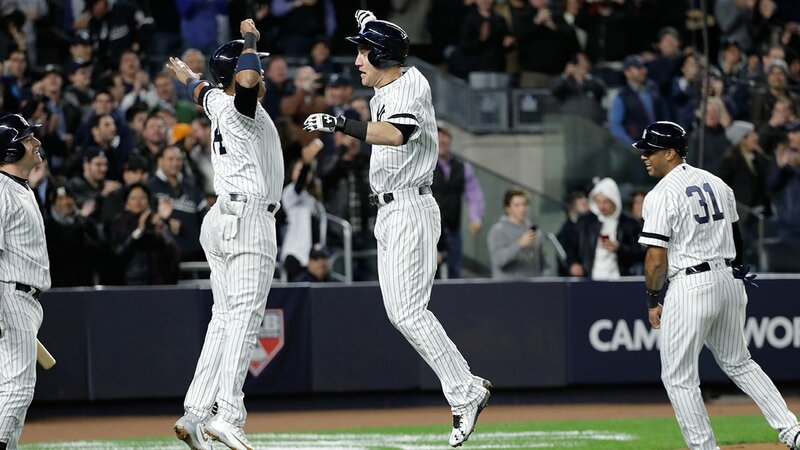 BRONX (WABC) -- Monday night's frigid temperatures in The Bronx did not have an impact on the Yankee bats. This was a crucial turning point in the series for The Bombers in trying to avoid being down 3-0 to the Houston Astros in the ALCS. The Yankees responded by defeating the Astros 8-1 in front of a packed house at Yankee Stadium. CC Sabathia took the ball for the game 3 start, and lived up to the expectations. Sabathia was 9-0 this season after a Yankee loss, and has been the one called upon to get his team back on track. Monday night, he backed that up and then some. Not to mention the Yankee bats came alive in game 3 with some accurately placed hits, with a little help from those infamous Yankee Stadium friendly home runs. Sabathia pitched himself out of some trouble in the third inning and escaped a bases loaded threat unscathed. By the time he took the hill to start the fifth, he had built himself a very comfortable 8-0 lead. What CC's performance has given manager Joe Girardi is a deep sigh of relief. A solid performance going six innings, three hits and striking out five for the 37-year-old left-hander, kept the bullpen arms fresh. In a series like this, it is important to not over-tax your relievers. With a solid outing like what we saw Monday night from Sabathia, he has given his manager some flexibility moving forward. Especially with the quick turn-around for game 4, at 5 p.m. on Tuesday. Jersey's own Todd Frazier got the scoring started by taking an "excuse me" swing at a pitch, and planting it 365 feet into the short porch in right field. It was Frazier's first career post season home run, giving the Yankees a 3-0 lead in the second inning. Greg Bird led off the bottom of the fourth with a ground rule double. After a Frazier walk, Chase Headley hit an RBI single to shallow right center, scoring Bird and advancing Frazier. Gardner would be hit by a pitch, and eventually advance to second on a wild pitch, scoring Frazier, giving the Yankees a 5-0 lead. Then walking to the plate was Aaron Judge who crushed a three-run homer, 371 feet over the left field wall and giving the Yankees an 8-0 lead in the fourth inning. At this point Yankee Stadium exploded with exhilaration, and fans felt right back in this best of seven series. The Yankees look to keep the momentum going on a late Tuesday afternoon start, as they face the Astros in game 4 at Yankee Stadium down two games to one. For the Yankees, Sonny Gray will get the start, while the Astros have yet to announce their starting pitcher.